Chef Vittorio Ettore is the chef/owner of Bistro 5, an excellent Italian restaurant in Medford. The restaurant is ten years old, having opened in 1999. Chef Ettore is part Italian and part Venezuelan and has spent a number of years in both countries. His restaurant uses fresh, local ingredients and the menu changes frequently, reflecting the availability of those ingredients. I most recently had an exceptional Heirloom Tomato dinner there, and all of my previous meals there have been quite delicious. I believe Chef Ettore is very creative and highly recommend you check out Bistro 5. How important is culinary creativity to you? It is the driving force that motivates me every day, it is also fun to keep my customers wondering what's up next. It keeps everyone in the kitchen involved and always alert because the dishes are constantly evolving. What are your most significant inspirations for your culinary creativity? Traveling, being exposed to different cultures and their appreciation for food What makes those matters so inspiring? When I am traveling I am not running a business, I am relaxed, enjoying the surroundings and always observing anything edible. Where do you get your ideas for new recipes/dishes? I am always in search of ingredients, once I find something that interests me I go at it! Fish markets, farmer's markets, specialty distributors, etc. What is your process for creating a new recipe or dish? First, find an idea that needs a twist (prosciutto & melon). Second, understand what makes it so special (such as "sweet & salty"). Third, understand the textures and then change everything. That can lead to a dish like "Prosciutto and melon risotto." You cook the rice with watermelon juice instead of chicken stock and at the end add diced cantaloupe and honeydew. Then, plate and top off with a very thin slice of prosciutto. Do other members of your staff assist with creating ideas for new recipes/dishes? When I find that idea/concept I throw it out there to the staff, I take their input maybe use it maybe not... we never know. How do you test new recipes/dishes? The customer. Once I like a new dish, I have it as special. Then, I go in the dining room collecting feedback from the customers. What is the most difficult part of culinary creativity? Time. There is never enough time to sit down and think and test the food. Do you ever experience "writer's block," an inability to be creative, and if so, how do you deal with it? Unfortunately all the time, and it has to do with all the other stress that is attached to owning a restaurant. When possible I set aside time and stay at home, no cell, no internet, a few books, some menus from Italy and start throwing ideas on paper. Can you relate to me an interesting or unusual anecdote concerning the creation of a new dish/recipe? I was shopping for dishware and the next thing I knew, someone asked me if I was ok because I was staring at one dish for so long. All sorts of foods were going through my head that would fit perfectly in that dish. The next day I made a lobster cappuccino, savory biscotti, truffled foam, and porcini powder. Unlike some of the prior chefs I have interviewed, Vittorio does not keep a notebook of ideas, though he stated he probably should. My new column of "A Passionate Foodie" can be found in the September 30 issue of the Stoneham Sun newspaper. This is a weekly column that concentrates on reviews of local restaurants though it also sometimes touches on other food and wine topics. The new column has been published today and will be available online soon. The new article discusses three new places of interest to food and wine lovers. This includes Bobby's Grille, a new restaurant in Wellesley where Chef Stephen Bell, of Savory Tastes Cafe fame, is the Executive Chef; the Olde Redding Butcher Shoppee, a new butcher shop in Reading; and Central Bottle, a new wine store in Central Square, Cambridge. When I arrived at the Hotel Indigo in Newton, I was unsure what to expect from its restaurant, BOKX 109 American Prime. Sometimes hotel restaurants can be lacking, too generic, too boring. From what I had seen on their website, the restaurant had promise, a Las Vegas-influenced steakhouse with a very intriguing menu. So, I was hopeful yet with a little trepidation. I had been invited by a PR firm to attend a special wine dinner, which was showcasing the wines of Napa Valley’s Truchard Vineyard with special guest Anthony Truchard. Executive Chef Evan Percoco had created a five-course dinner to accompany the wines. The menu was enticing and I knew the wines should be quite good too. This will actually be a joint review with my good friend and fellow blogger Dale, of Drinks Are On Me. I will primarily be reviewing the food while Dale will primarily review the wines. This is kind of an experiment so your feedback on the results are welcomed. When I first walked into Bokx 109, its look and decor were impressive, lots of dark wood and leather. It has the look of a high-end steakhouse. There was a lengthy bar, which was quite busy, and I sat to have a drink prior to the dinner. The bartender, Michael, was very professional and I enjoyed a very pleasant drink of Bokx Bubbles, St. Germain and Prosecco. The kitchen is open, and you can watch the chefs in action. While I sat at the bar, I had a perfect view of the kitchen and spent some time watching them work. Our dinner began with some hors d'oeuvres as we stood around, with a glass of Roussane, and chatted. These little items included oysters with lychee & a green smith apple mignonette, mushrooms pupussa with hen of the woods, farmers cheese, and green papaya slaw, and crispy chicken with sausage, and corn jitters. Servers constantly came by, carrying trays of these foods, and you could enjoy as many as you wished. I was very partial to the oysters, though the other items were quite good too. I especially enjoyed the combination of flavors and textures, and it boded well for the rest of the dinner. It was also at this time that I met Anthony Truchard. He was quite personable and we had a very interesting conversation about wine, food and more. As he also sat next to me during dinner, we were able to continue our conversation. I found within him the passion I seek in chefs, wine makers, and more. Plus, I very much enjoyed his wines. Our second course, the first we had while sitting, was Bass and Lobster with artichoke, asparagus, and preserved lemon butter. I was struck by the apparent freshness of the ingredients. The bass was moist, plentiful and tasty, as was the lobster. What really intrigued me though was the wonton, fill with a seafood mousse. The crunchy wonton was fried just right, and the filling was delicious, creamy and bursting with taste. They could easily make a regular appetizer with these wontons. Next up was Wood Grilled Quail with cranberry, wheat berry, almond, and licorice. This dish reminded me very much of Fall, more rustic flavors. The tender quail meat was very appealing, especially as I am a fan of quail. The flavors blended very well and I could easily picture this as an excellent alternative to a commonplace chicken dish. In addition, the quail had plenty of meat. They did not skimp on portions. The next course was another of my favorite meats, Shepherds Pride Lamb Loin with morels, candy fennel, chard, and chippolini. The meaty and tender lamb slices had that unique lamb taste, slightly wild, which I very much enjoy. The earthy morels paired well with the lamb and the fennel added an interesting element. Once again, they did not skimp on portions and I very much relished this dish. Though dessert was next, we were able to get an extra dish to try, the Bokx Fries. These fries are fried in duck fat, and come in three types: truffled, herbed and smoked. Duck fat does make a difference! These were just exceptional fries, with a crisp exterior, fluffy interior and lots of flavor. The truffled fries were my favorite though I very much enjoyed all three. Finally, dessert arrived, a Lookout Farm Braeburn Apple Tarte with almond and bourbon. Somehow I found sufficient room to eat dessert, and was very glad that I did. A flaky tart, fresh apples and a nice blend of flavors. Service was excellent. Overall, I was impressed with dinner and the culinary skills of Chef Percoco. All of the dishes were not items that you might necessarily relate to a steakhouse, but show the creativity and versatility of the chef. I will be sure to return, as there are plenty of items on the menu that intrigue me. It was also great to share this dinner with friends, old and new. It was a very fun and interesting time, and I would recommend that my readers check out their future wine dinners. Just a head's up for my dedicated carnivore readers. A new butcher shop, the Olde Redding Butcher Shoppe, is scheduled to open in Reading on October 19. Located at 169 Haven Street, the butcher store is owned by Greg Chesnulovitch, a Reading resident and a former butcher at the defunct Atlantic Super Market. This new shop will offer custom cut meat, prime and choice, as well as deli items and some prepared foods including marinated steak tips and chicken cordon bleu. I will definitely check out this new butcher shop soon after it opens and then report back. It sounds very promising, and I do like the idea of supporting a local, small business, so I do hope for the best. With the advent of fall, there are certain seasonal treats which become more readily available, especially items using apples. One of my favorites is fresh, cider donuts. You will also find, especially at local fairs and carnivals, candy and caramel apples, which might be covered with coconut, nuts, colored jimmies or other items. Candy apples were invented first, around the turn of the century, though their exact origin is murky. Candy apples, with their distinctive red candy shell, are usually made with a flavored boiled sugar recipe. Caramel apples, made with melted caramel, were first developed by Kraft Foods in the 1950s. The popularity of each varies across the country, though I have been noticing, to my dismay, an increase in the ubiquity of caramel apples locally. I love candy apples, especially covered with coconut. It is not always easy to take that first crunchy bit of a candy apple, breaking through the hard shell, but it is rewarding. With a fresh, crisp apple, the candy, coconut and fruit make for a very appealing treat. For me, the caramel apple fails. I love caramel, from a nice sweet sauce atop ice cream to a salted, gooey center of a dark chocolate. But I don't like its soft gooey texture on a caramel apple. It is too soft, and just doesn't seem complementary to the crisp apple. Plus maybe it is a bit sentimental, as growing up I most often had and enjoyed red candy apples. So I am dismayed that red candy apples are much less available lately. Where have they gone? Why aren't they more popular now? Why have caramel apples become much more popular? I don't have answers to these questions. But I want them to bring back my red candy apples. I want that candy crunch rather than the gooey chew. Though Boston Restaurant Week is over, there is one restaurant which does not seem to realize it is over. Da Vinci Ristorante will continue to celebrate Restaurant Week every night for the remainder of the year by offering their signature 3-course prix fixe menu at the special price of $33.09. Da Vinci Ristorante recently unveiled their new seasonal menu, and guests will have a choice between twelve primi courses, sixteen secondi dishes, and five dolci options. The new primi offers include: Pumpkin Soup (Caribbean potatoes, carrots, pumpkin puree, cinnamon, nutmeg and ginger); La Vaschetta seared I Pettini (scallop stuffed with mushroom, wrapped in phyllo dough, pancetta, corn tomato English pea orange ragout); and Beef Carpaccio (shaved parmiggiano, celery sorbet). For the secondi course, guests will choose from seasonal pastas and entrees, such as: Butternut Squash Agnolotti (stuffed with Amaretto Biscotti butternut squash, finished with a brown butter sage sauce); Short Rib Ravioli (served with pecorino cheese, finished with veal demi glaze balsamic vinegar); and Pork Shank (braised and served with saffron risotto and broccoli rabe, finished with port wine apple juniper berry sauce). The dolci options include: Crostata (topped with fresh berries) and Vanilla Gelato (fresh blueberries). This special Restaurant Week menu is available Monday through Thursday from 5-10:00pm, and Friday and Saturday from 5-6:00pm. After 6:00pm on Friday and Saturday, Da Vinci offers an a la carte version of the fall menu. After a lengthy hiatus, I have posted a new food-related short story on The Passionate Foodie: Fiction. This new story, You Had Me At Foie, was inspired by a comment made on Twitter by Jackie. She used the phrase "you had me at foie" and it struck me as an excellent title for a story. So I had a title and just needed to create the story, which proved fairly easy. It almost seemed to write itself. I hope you enjoy the story and please provide me your feedback. I am considering whether to write a sequel to this story or not. I have a basic idea for the sequel but am not sure whether it would take away from the original story or not. It is good news when a favorite chef undertakes a new and promising endeavor. I have recently received such pleasant news, that the talented and passionate Chef Stephen Bell, formerly of Savory Tastes Cafe in Reading, is the Executive Chef at new restaurant opening soon in Wellesley. Bobby's Grille will be an upscale American restaurant, open for lunch and dinner, offering some creative homemade recipes, all reasonably priced. You'll find items such as Filet Mignon Sliders, Two Cheese Mac, Lobster Bisque, Tenderloin of Beef Madeira, Golden Chicken Pot Pie and much more. It is a family-owned and operated restaurant, a collaboration between Bob Walsh Sr. and his son, Bobby Walsh Jr. Specialty dishes and secret sauces are named in honor of the Walsh family address of "’81." This restaurant certainly seems conducive to Chef Bell's talents and I very much look forward to checking it out. The restaurant is supposed to open in September but I have not found confirmation of an actual date yet. The restaurant is located at an easily accessible location, just off Route 128, on Rt.16. As a bonus, it is located just down the street from Lower Falls Wine Co., one of my favorite wine stores. Now when I visit the wine store, I'll have a new place to have dinner. Stay tuned for my future reports. My first return visit to Craigie on Main was for Sunday brunch. The menu was certainly compelling and I expected only good things based on my last visit. I was not disappointed in the least. They serve brunch on Sundays, from 11am-2pm, and you can check out a sample menu though note that the menu will likely be slightly different at the restaurant. You'll find both interesting breakfast and lunch choices on the menu. They also have a Prix Fixe option, three courses for $29. This option is quite flexible, and you can basically choose almost any item as one of your courses. I began with their Sunday Sparkler, a cocktail containing Absinthe, Calvados and Sparkling Wine. I was curious how well the flavors would blend but they worked out fine. The drink had a strong citrus flavor and was much smoother than expected. A good drink that I would order again. For brunch, my mom and I both got the Prix Fixe, with similar first and third courses but different second ones. We began with the Home Made Donut, which was absolutely delicious! The warm donut was very crispy on the outside with a soft interior, topped by what seemed like a sweet caramel sauce. Why can't normal donut shops make donuts that taste this good? My mother chose the House-Cured Wild King Salmon and Kona Kampachi as her second course. It came with an onion bagel and traditional accompaniments. The plate was plentiful with food and the salmon was silky smooth and flavorful. The Kampachi rillette was also quite tasty, and easily smeared on the bagel. I opted for the Craigie “Dimanche” Sausages, Buttermilk Biscuit, Gravy and farm fresh eggs. A simple but very well done dish. The sausage was very tender, without any gristle bits you sometimes find in sausages, and very flavorful, spiced just right. The biscuit was flaky, buttery and soft. The gravy was light, not the thick glop you get elsewhere. Everything about this dish pleased me very much. We also ordered a side dish of Grilled Pork Belly, just because pork belly is so good. My mother had never tried pork belly before, and was a bit hesistant, but once she tried it thought it was delicious. They prepared it well, with plenty of delicious, tender pork and silky fat. The restaurant also gave us a complimentary dish of Grilled Peaches, fresh, tender peaches. Our final course were three Mini Profiteroles, small ice cream puffs topped by chocolate sauce. Obviously very fresh ingredients, interesting flavor combinations and just the right amount of sweetness. A fitting ending to our tasty brunch. Chef Maws continues to impress and if you want to impress someone, then take them to Sunday brunch. It is not often that you get the opportunity at a restaurant to taste brains. And for most people, they are very glad of that fact. Yet I have a more adventurous palate and was quite willing to try them, a dish I had never tried before. In addition, this was the first time I dined at Craigie on Main, a very popular and esteemed restaurant owned by Chef Tony Maws. Located close to Central Square in Cambridge, the restaurant is well known for using local, seasonal and sustainably sourced ingredients. Plus, Chef Maws is well known for using every part of an animal, especially pigs. In fact, I was attending a special "Whole Hog" dinner. My dining companions for the evening were Jackie and David, fellow foodies, bloggers and pig lovers. Jackie also posted her own review of the evening and it is well worth reading. They are both great people, and we had quite an enjoyable night, chatting, eating, drinking and just savoring everything. We began our multi-course dinner with a plate of Hors d'ouevres, called "les Cochonailles" which roughly translates as "Piglet's Delight." From lardo to pate, each of these small bites tantalized the senses with their differing flavors and textures. The crispy pork was especially delicious and I could have easily chowed down an entire bowl of them. Just give me wine and the crispy pork and I would have been very happy. For my First Course, I selected the Tortellini of Braised Pork Belly with was accompanied by squash blossoms, squash jus, and calaminthe. The light tortellini, perfectly cooked, burst with porcine flavor with the tender pork belly. The jus and calaminthe flavors complemented the dish. Another excellent course. For my second course, I opted for the House-Made Boudin Noir and Chorizo-Stuffed Grilled Local Squid, accompanied by fresh white corn polenta and basil. Another excellent dish. The squid was very tender, the chorizo spicy and the polenta creamy and flavorful. The tastes combined well together and there was plenty of food. Though I did not select the Crispy Fromage de Tête for my second course, Jackie ordered it and I got to taste it. This is crispy head cheese, topped by a sunny side egg. I really liked the flavor of this dish, the crispiness of the head cheese making it very appealing. And of course the egg, especially the yolk, added to the enjoyment of the head cheese. For my third course, I went with the Vermont Organic Pork Three Ways which included Spice-Crusted Ribs, Glazed and Grilled Belly, and Bacon-Wrapped Loin. It was accompanied by pea greens, local black trumpet mushrooms, and spiced puree of eggplant. This was a pork lover's dream, three varied preparations, each delicious in it own right. The ribs were incredibly tender and flavorful, while the pork belly was decadently scrumptious. The loin was meaty and tender, with the salty flavor of bacon. David and Jackie shared a half-head of a pig for this course, and each received a plate of pig brains as well. I tasted the brains and they were creamy, reminding me of cream of wheat, though they were nothing special to me. It was interesting, and I am glad I tried them, though I doubt they will become a regular dish for me. The pig head though was incredible! I got to taste the snout, ears, skin and meat and everything was so delicious. The skin, crisp, salty and flavorful, really impressed me and I could have eaten a huge plate of just the skin. The head had been brined and then prepared sous vide. The meat beneath the skin was also very tender, and any fat was smooth and creamy. Chef Maws clearly knows how to prepare a pig to satisfy any foodie. Dessert was Cornbread Pain Perdu with plum coulis and anise hyssop ice cream. I love cornbread and this was a superb specimen of such, moist and full of rich corn flavor. The ice cream had an intriguing herbal flavor that did mix well with the corn bread and plum flavors. A fine ending to an excellent dinner. So my first experience at Craigie on Main was fantastic, and certainly gave me motivation to return to the restaurant. I didn't have a single complaint about the food and service was excellent as well. Plus, with the good friends accompanying me, it was an even better night. a Milk-fed Confit Baby Pig Head for Two (from an organic Quebec farm). I shall return there soon and will report back again. Starting this weekend, on September 27, Chef Ken Oringer plans to start opening the Clio dining room on Sundays, at 5:30pm. You can order off their regular menu of French-American cuisine but there is another intriguing option as well. Chef Oringer is embracing Chicken! Each Sunday will present Ken’s Fried Chicken Sunday Supper, a prix fixe option for $35. Each Sunday, the chicken menu will vary, from Southern Fried to Garlicky Korean. Plus, there will be accompaniments like cornbread, greens and seasonal fruit crisps. It will be intriguing to see what concoctions Chef Oringer creates, and the price seems very reasonable as well. If I stop by some Sunday, I will of course report back. At the end of August, OurGlass Wine Co., held a Grand Re-Opening Wine Tasting and I attended, to gauge the progress of the store, to see how it is faring under its new management. If you will recall, I previously raised some concerns about the direction that the wine store was headed. It seemed that it might become more of a liquor store rather than a boutique wine store. As I drove up to the store, I noticed a sign in the window for a 30-pack of beer. The type of signage you see at liquor stores. Inside the store, it was a bit crowded with all of the tables set up for the wine distributors and food vendors. There were over 65 wines available for tasting and foods provided by vendors such as Dom's Sausage Co. and Karl's Sausage Kitchen. The wine selection had some winners, though lots of familiar wines too. Adonna Imports, Vineyard Road and Ideal Wines & Spirits were present and offered my favorite wines of the day. I'll provide a few highlights here. 2007 Kalmuck Pink, Austria ($10.80)-A Rose made from Zweigelt. A dry, Old World style-Rose with nice, red berry flavors and mineral notes. 2008 Migliavacca Grignolino, Italy ($12.60)-A very aromatic wine with an incredible red berry aromas. A delicious taste of cherry, raspberry and mild spice highlights. 2008 Adami Gardino Prosecco ($20.70)-An amazing sparkling wine. Produced from a single vineyard, this wine explodes with flavor in your mouth. It is creamy with lush tastes of apples and peach. One of the best Proseccos I have ever tasted. 2007 Barrail Meyney Bordeaux ($9.90)-An easy drinking Bordeaux, very much a pizza or burger wine. 2006 Selvapiana Chianti Rufina Bucerchiale ($32.40)-Another exceptional, single vineyard wine. Smooth, dark berry flavors with restrained tannins and a lengthy finish. Plenty of complexity and a nice balance. Definitely a food wine which should impress. 2007 Lesec Costires de Nimes ($13.50)-A blend primarily of Syrah and Mourvedre. Delicious blueberry and spice flavors, mild tannins and a decent finish. An excellent value for a wine of this character. 2007 Palivou St. George ($9.90)-Another smooth, fruity, easy drinking wine, just right for a casual meal. I was very pleased with all of the food they provided for the tasting, including steak and chicken bites. That certainly helped with the wine tasting, giving you a better idea of how the wines would interact with food. And both Dom's Sausage Co. and Karl's Sausage Kitchen served plenty of delicious food. But the store still seems to be sliding down into a liquor store, away from its prior status as a boutique wine store. In addition, they recently announced that Deanna, who had long been a manager there, is leaving. Deanna's passion and knowledge will be truly missed. I'll continue to monitor OurGlass but I am not too hopeful. Despite these tough economic times, it seems some bold individuals are still opening new restaurants and wine shops. I have recently posted about a few of the new wine stores that have recently opened, or will be opening in the near future, and I am pleased to report on another one. Bottles, a new wine store in the North End, opened this past July. I stopped by recently to check out the store when they were hosting an appearance (and wine tasting) by the famed wine writer Alice Feiring. I was pleased with what I found at the store and I shall return again. The manager is Kevin Cassidy, a very personable and passionate wine lover. Their other employees, "consultants," include Kelly Coggins (who used to work at Rialto), Mike, Seth, and Alison. Most, if not all of the employees, once worked at the Wine Bottega in the North End. I have met Kelly before and he too is a very knowledgeable and passionate wine lover. They certainly have a talented and knowledgeable staff. It was a real pleasure to meet and chat with Alice Feiring. She was extremely personable, down to earth, and genuine. In her writings, she sometimes can come off seemingly as abrasive, but I found none of that in person with her. She generously spent time chatting with many of the people who showed up for the tasting. She is an interesting conversationalist and we discussed several different wine topics. If you get a chance to meet Alice, you definitely should take the opportunity. The shop is small yet the rectangular space is used well to present the wines and beers without seeming overcrowded. The left wall is covered by wine racks containing about 80 wines. Overall, the store may contain 120 or more different wines, as well as 50-60 assorted beers. The right wall, where the cashier counter is located, has a smaller wine rack, where some of the more expensive wines are displayed, as well as a few books and even some olive oil. They have a single Sake, a Nigori, though may carry more in the future. In the middle of the store is a short counter, also containing more wine selections. There still is adequate space around that center counter to walk around. At the rear of the store is their cooler unit, where most of their beers are kept, as well as some wines. They will soon allow you to make your own six packs of beer, picking and choosing individual bottles you wish to drink. For a beer lover, that sounds like a very cool benefit, a way to sample beers you know little about, or which intrigue you. As for their wine selection, they carry primarily small producers, many European as well as many which are organic or biodynamic. I was familiar with numerous wines they carry, and they are generally excellent wines, one that most wine lovers would enjoy. For example, at their tasting, they had compelling wines such as the 2007 Catherine & Dominique Derain Bourgogne Aligote, 2007 Occhipinti Il Frappato and 1989 Lopez de Heredia Vina Tondonia Blanco. Prices were average for the wines they carry, and they stock a full range of price points. The store will hold free wine tastings every Thursday night from 5pm-8pm, as well as special events at other times. With an excellent selection of wines and a passionate and knowledgeable staff, this is welcome addition for wine lovers. Please stop by and check out this new store. I will be back and maybe I will see some of my readers there. Morton’s and Ruby Wines are hosting a special dinner and silent auction to benefit the Susan G. Komen Foundation’s 3 Day Race for the Cure. In honor of Breast Cancer Awareness Month, Morton’s will host a four-course dinner paired with fine wines donated by Ruby Wines. At the end of the evening, a silent auction benefitting the Susan G. Komen Foundation’s 3 Day Race for the Cure will be held. Some auction items include a pink, leather Beijo ribbon purse, a baseball signed by Kevin Youkilis and an official NHL hockey stick brandished with the Boston Bruins players’ signatures, among several others. Walking the 60 miles in memory of her mother, will be Morton’s Sales & Marketing Manager, Katie Butler. RESERVATIONS: Please call 617-266-5108 to make a reservation. Please support an excellent cause. Rant: Wine at Farmer's Markets? When will Massachusetts legislators smarten up and start changing antiquated laws restricting wine? We all know the difficulties and prohibitions against shipping wine into Massachusetts. But other restrictive laws exist as well and need to be changed. We need to support one current effort to change such a law. Senator Jamie Eldridge, D-Acton, is the lead sponsor of a bill that would permit wine tastings and sales at farmers' markets. It also includes provision for beer and distilled spirits, though the primary aim is for wine. The bill has yet to receive a formal hearing. This bill is supported by a group representing Massachusetts wine makers as well as state agriculture officials. With all of the farmers markets now around, this would open up a larger market for local wines, especially as those who patronize such markets often give much support to local producers. These markets would have to apply for a liquor license and enforce underage drinking laws. Who opposes this bill? Well, some of the strongest opposition comes from liquor store owners. They allege the law would make it easier for underage teenagers to obtain alcohol. This argument does not really seem to be supported by the evidence. How many Massachusetts wineries, which have tasting rooms, have ever been cited for serving underage teenagers? I very much doubt that has ever been a serious problem. As most local liquor and wine stores usually don't stock a significant amount of Massachusetts wine, they would not really lose much business if this bill was passed. They should be supporting this bill, helping our local wineries. There are currently 34 licensed wineries in Massachusetts and more will likely start in the future. They are all small producers, and can use all the help they can get in marketing and selling their wine. So give them the ability to sell at farmer's markets. Are you seeking a Kosher sparkling wine? Rather than looking for a wine from Israel, you might want to consider a Cava from Spain. Elvi Wines is a family-owned company in Spain that only produces Kosher wines, from several different D.O.s, including Priorat, Utiel-Requena, Ribera del Jucar, La Rioja, and Cava. I previously reviewed their 2004 Makor de Elvi, which I really enjoyed. So when I found their Cava at a local wine store, I had to try it. The Adar de Elvi Cava Brut ($24) is produced from the traditional Cava grapes: 40% Xarel·lo, 30% Macabeo, and 30% Parellada. The wine is aged for about twelve months in the bottle and it only has an alcohol content of 11.5%. It is very dry with interesting floral notes and mild citrus notes. It is crisp and clean with a moderately long finish, and without any yeasty aftertaste. I very much enjoyed this Cava, and actually drank it with some potato chips. The Cava went well with the salty chips. This winery does not really emphasize on their labels that the wine is Kosher. The designation is there if you look carefully, but it is not a marketing tool for the winery. You might not even realize the wine is Kosher if you did not scan the label carefully. This is just a delicious wine that also happens to be Kosher. It gets my recommendation! Chef Barbara Lynch strikes again! Lynch's culinary empire has been spreading into Fort Point, and I recently had the chance to check out one of her ventures, Sportello. This restaurant is her interpretation of a classic diner, offering trattoria-inspired italian cuisine for lunch and dinner. It certainly has the feel of a modern diner with its counter seating and minimalistic decor. The menus double as placemats. For lunch, there are appetizers, panini and pasta dishes. The dinner menu is lengthier, eliminating the paninis and providing entrees as well. The selections sound appealing, especially all of the different pasta dishes. Though modeled after a diner, it is pricier than what you might expect, though the quality of the food likely justifies the cost. I stopped by for a quick bite, a late lunch, though I will be sure to return. Before my food arrived, I received a plate of sliced bread with an intriguing ricotta spread atop olive oil. Though ricotta is not one of my favorites, this spread appealed to me. It was very creamy, reminding me of a delicious goat cheese, and it was delicious smeared on the bread. For my meal, I selected the Papardelle ($17), with a bolognese sauce and fried basil. The pappardelle pasta was a wide ribbon of past, cooked perfectly, and covered by an outstanding bolognese. The bolognese had plenty of meat, in an orangey colored sauce, and was extremely flavorful. I have had the bolognese at Lynch's other restaurants, and this, not surprisingly, was equally as good. I highly recommend this dish, which I consider worth the price. The restaurant also has a bakery inside, though its stock was somewhat depleted when I was there. They open early for breakfast during the week, and a little later on the weekends. You will find a diverse choice of items, including muffins, cider donuts, scones, croisssants, bread, cupcakes, chocolate treats, pastries, cookies, and more. What was available looked quite good and I did pick up a few items that I later enjoyed. I really need to get there for breakfast some time, especially to try their cider donuts. Though my experience here was limited, I see plenty of potential. What food I did taste was quite delicious. I expect the other menu options and bakery items will be equally as good. I will be returning to Sportello, and will report back when I do. Give this place a try! Gouda is great! I really enjoy the taste of Gouda cheese, especially aged Gouda. So, I was very excited to see that the latest issue of Culture: The Word on Cheese has a cover photo of Gouda, as well as a lengthy article on Gouda inside. Culture is one of my favorite new magazines and each issue has been even better than the previous one. If you enjoy cheese, you have to buy this magazine. Pairing cheese with Spanish sherry. For example, pair a Fino Sherry with a Manchego cheese. A directory of cheese shops, markets, restaurants and more in Chicago. A local blogger and friend, Jackie of the Leather District Gourmet, also has written an article in this issue. The article, From Cave to Cart to Cooking, is a well-written piece about Terrance Brennan, who brought the cheese cart to American restaurants. The article even mentions Dutch Gouda numerous times. So run out and buy the newest issue of Culture! And then read it while savoring some cheese and wine, or sherry, or cider. There was more than just cheese available for sampling at the Vermont Cheesemaker's Festival. A number of artisan food producers were also present, offering items such as marinades to bacon. It was good to have something else to try, to break up all of the cheese tasting. I won't cover every artisan food producer at the festival but will instead highlight a few of them that stood out to me, for various reasons. This is a small home-based company based in Burlington, Vermont. They pickle several different vegetables, some hot. Their signature product is Pickled Garlic ($7/jar), and they even provide several recipes. I enjoyed the pickled garlic, which was fresh with a clean taste, a nice blend of pungent garlic with the slightly tart pickling flavor. The Hot Pickled Carrots ($7) also impressed me. They too were fresh and crisp, with just the right amount of heat. They also carry, though some are seasonal, Pickled Snap Peas, Green Tomatoes, Beans, Squash, Hot Peppers, Dill Spears, Hot Spears, and Sweet Spears. I really like the freshness of these products, and they seem very versatile as well. I am sure there are plenty of recipes which these pickled veggies would enhance. I bought a few jars of veggies and will be trying them with different dishes. Founded in 2002, Leigh Williams wanted to share her "passion for creating delicious chocolates by hand." Located in Stowe Village, she uses as many fresh, local ingredients as possible. For example, they use Mitzi's Fresh Mountain Breakfast in their Green Mountain Turtles and Clusters. They make homemade marshmallow and caramel. They even use locally made wine, beer and spirits from places including Green Mountain Distillers and Boyden Valley Winery. They are also "committed to social responsibility, environmental stewardship and to creating a healthy local food system." They produce a wide range of chocolate products, from truffles to chocolate covered cookies. They even have chocolate covered cheese! I got to taste the Vermont Butter & Cheese Chevre Lavender Truffle, Jasper Hill Farm Bailey Hazen Blue Cheese Truffle, and Chocolate Covered Ploughgate Creamery Willoughby. All three were quite delicious, with a smooth, creamy and sweet chocolate. The cheeses and the chocolate actually paired well together, especially the blue cheese. Based on these samples, Laughing Moon produces an excellent product and are well worth checking out. Plus, it is very good that they support so many other local producers, as well as their commitment to social responsibility. More chocolate and cheese! Katherine and Shawna are the co-founders of this company, which was born on January 1, 2008. They spent plenty of time trying all sorts of brownie recipes before settling on their "signature" recipe. They also have a goal of support the local community. They currently produce about seven different flavors of brownie, including Maple Toffee Crunch, Peanut Butter, and White Chocolate Raspberry. At the festival, they had their Dark Chocolate Chevre available for tasting. This is their twist on the classic cream cheese brownie, where they use locally made goat cheese. I do love a good brownie, and this one did impress me. It was moist and chocolatey, with the creamy goodness of goat cheese. This is the type of brownie that I prefer, a nice balanced treat that is neither too dry or overly moist. I bet it would be delicious, slightly warmed and topped with some vanilla ice cream. On October 8, Park Square’s Italian eatery Da Vinci Ristorante and Domaine Select Wine Estate’s Northeast Division Manager Daniel Burgio will combine forces and host “A Night of Perfect Balance.” This five-course specialty Italian wine dinner will highlight Executive Chef Peppino’s culinary creations paired with Burgio’s vineyard choices. Daniel Burgio will introduce each course and provide a brief commentary on the selections, alongside Chef Peppino. Cost: This complete 5-course menu with wine pairings is available for $65 per person. The other evening I ran into Maureen Rubino, who used to work at the Grapevine Travelers wine store in Medford. Maureen is a very personable woman, with a true passion for wine. She had excellent news, that she was involved in opening a new boutique wine store, Central Bottle, in Central Square, Cambridge. Central Bottle is a collaboration between four friends: Maureen Rubino and her husband David Rubino & Liz Vilardi and her husband Nick Zappia, who are co-owners of The Blue Room restaurant. Their website states: "Our focus is on small production, handcrafted, sustainable, organic and biodynamic wines from all over the world. We intend to feature high quality wines that offer great value from responsible producers and offer a well-chosen selection of microbrew/craft beers. And tasty cicchetti and gourmet food items." One night a week, the store will also become a wine bar, where you can sit and enjoy a glass of wine with some home-made food. The store will also have frequent tastings, as well as events with guest chefs. Central Bottle is currently scheduled to open on October 15, though that is subject to change. I am excited about this opening as I think this could truly be an excellent, wine lover's destination. Maureen certainly possesses a strong passion for wine, and she selected many choice, artisan wines when she worked for Grapevine Travelers. I will certainly stop by this store soon after it opens and will report back when I do. With all of the available cheeses for sampling at the Vermont Cheesemaker's Festival, it was a bit overwhelming. I could not fully dedicate myself to a lengthy tasting at any one table, or I would have had to ignore so many other deserving cheesemakers. So, the best I can present now is to highlight several cheesemakers that stood out to me, for various reasons. These are by no means the only good cheesemakers I encountered. Overall, the quality of cheese was very high and they all deserve recognition. Yesterday's post gave you a link to a list of all the cheesemakers who were present at the festival. My main point is that you definitely should check out and support local cheesemakers. They are producing some amazing cheeses which I am sure you will love. Strangely enough, the first cheesemaker I visited at the festival was not even from Vermont. I randomly chose their table, not knowing at first that they were from Rhode Island. The Creamery originated in 2007, a collboration of local food advocate Louella Hill and Mark Federico, owner of Providence Specialty Products. They are currently the only producer of cheeses in Rhode Island. They make a variety of cheeses, including a Gouda-style cheese, ricotta, mozzarella, feta, farmer's cheese and more. Everything I tasted was very good and my favorites included their Atwell’s Gold (reminding me a bit of Parmigiano-Reggiano), Divine Providence (a mild Gouda like cheese) and the Queso Fresco (soft, buttery cheese). This was certainly an excellent place to start my tasting at the festival, placing me in a pleasant mood. I had a little familiarity with this farm prior to the festival but it was not with their cheese. At the Wakefield Farmer's Market, I found some of their goat's milk caramel sauce. The farm itself is located in Brookfield, Vermont and is a small, family-owned goat dairy. They raise about 25 Alpine and Saanen goats that are pasture fed in season. They currently produce five varieties of goat cheese, including plain chevre, maple chevre, olive lovers chevre, ginger cilantro chevre, and sundried tomato basil chevre. Their goat cheese is very creamy and fresh tasting. But it is their caramel sauce that really stands out. They produce four varieties of goat's milk caramel sauce: original, vanilla bean, coffee bean, and cinammon. The process for making the caramel is more similar to making maple syrup. They hand-stir fresh goat milk and organic cane sugar over a stove for about four hours. During that time, the sugars in the milk and the sugar caramelize and produce the caramel sauce. I have tried the original and vanilla bean and was impressed by their sweet, creamy flavor. I am a big fan of caramel and this was certainly one of the better caramel sauces I have tasted. I think the goat's milk might add more creaminess to the caramel. Located in Bennington, Michael Scheps is a third-generation cheesemaker. They produce fresh hand-stretched whole milk mozzarella, cherry-wood smoked mozzarella cheese, hand-dipped whole milk ricotta cheese and cheddar cheese bites. For their mozzarella, they use all natural ingredients and no preservatives. Both the mozzarella and smoked mozzarella were quite tasty, and very fresh. But what really intrigued me were the cheddar cheese bites. These are the youngest form of cheddar, made in a traditional manner. They are small chunks of cheese pulled from the vat before they can be formed into blocks of cheese to be aged. They are soft, flavorful pieces of cheddar, a rather vibrant cheese. It is a simple cheese, a delicious snack which you can just pop piece after piece into your mouth. Cheesemaking in the village of Grafton extends back to the 19th century, though the original factory was destroyed by fire in 1912. In the mid 1960s, the nonprofit Windham Foundation restored the company. The Windham's mission is to promote Vermont's rural communities. Grafton produces numerous aged cheddars as well as some flavored cheddars. Maybe the most impressive cheese I tasted at the festival was the Grafton Clothbound Cheddar, pictured above. This cheese is made from raw cow's milk and traditional animal rennet. It is bound in cheesecloth and aged in caves for up to ten months. This cheese had an amazing, complex taste. The flavors burst into my mouth, a melange of nuttiness, butter, earthiness, salt and more. I so much wanted a nice glass of wine to pair with this cheese. This is truly a cheese lover's cheese, an exceptional example of the best of cheddar. This gets my highest recommendation. This is another cheesemaker who is not from Vermont. The cheesemaker, Jennifer Betancourt, actually lives in Maine and is in partnership with Smiling Hill Farm. Jennifer makes a wide variety of cheeses, from cheddar to camembert, from flavored curds to fresh mozzarella. All of the cheeses I tasted were good, and my two favorites were the Camembert and Tally Ho Peppercorn. Both were soft, creamy cheeses bursting with flavor, perfect to spread on bread or crackers. Bistro 5 and Wine-Sense are presenting together a special wine dinner with Hendry Ranch. On Tuesday, September 29th at 7pm, Chef Vittorio will create a special dinner that will be accompanied by several wines from Hendry Ranch of Napa Valley. Hendry Ranch is a family owned vineyard known among the wine community for producing some of the highest quality grapes in California. This five course tasting menu has been custom designed and paired with select Hendry wines. This dinner will be offered at the same value as their daily chef's tasting menu, $85 per person, (not including tax and gratuity). Seating for this event is limited so make your reservations as soon as possible. If you waited too long, then you were out of luck. There were plenty of posts on Craig's List seeking tickets, yet no one seemed to be selling. Only 1000 tickets had been sold, and those holding tickets were not surrendering them. Cheese had never been so popular. The Vermont Cheesemakers Festival was held on August 23 in Shelburne, Vermont at Shelburne Farms Coach Barn. The first festival had been held here back in 1996. This Festival was organized by the Vermont Butter and Cheese Co. in partnership with the Vermont Institute for Artisan Cheese and the Vermont Cheese Council. The Festival included about 50 cheesemakers, 20 Wineries and Breweries, and 15 Artisan Food Producers. There were over 100 cheeses available for sampling as well as other foods, from corn bread to sausages. Plus, you could purchase most of these items. You could also attend cooking demonstrations. As the Festival lasted from 10am-5pm, you had plenty of time to sample all of the delicious food and drink. Here is a list of all the cheesemakers who attended this event. Tickets were only $20, which I think was an excellent value for all of the food you could sample. If you wanted to sample the wine and beer, you had to pay an extra $5 for 16 tickets which could be traded for 1/2 ounce tastes of beer or wine. There were also a few seminars which you could attend, for an additional charge of $45. I just attended the main event, getting wine tickets too. Artisan cheesemaking is quite popular in Vermont, as the state has the highest number of cheesemakers per capita, over 40 of them. These cheesemakers produce over 150 different styles of cheese, made from milk obtained from cows, goats, sheep, and water buffalo. Check out the Vermont Cheese Council for a cheese trail map, list of cheesemakers, cheese varieties, event lists, and much more. To get to the Coach Barn, you had a take a leisurely drive through the beautiful grounds of Shelburne Farms. The various vendors had tables within the Coach Barn. As I showed up just as the festival opened, it as easy to walk around, checking out all of the available samples. But as I posted about before, the event eventually got too crowded and hot. Though it was a nice venue, it was not large enough for all of the attendees. Cheese! I enjoyed so many different cheese samples, from many Vermont cheesemakers, as well as cheesemakers from Rhode Island and New York too. An excellent diversity of cheeses and some very passionate cheesemakers. I have already posted about the Vermont wines I tasted, including some very good ones. Plus, there were interesting specialty foods, from chocolate covered cheese to pickled veggies. I will be posting more detail about specific vendors in the near future, highlighting those I found especially interesting. I will return again to this festival next year, though I hope they hold it at a larger venue. But if you want to go, I strongly advise you to buy your ticket early so you don't get shut out. At $20, this event was a bargain. If you are a cheese lover, you certainly won't leave the festival hungry. And it is cool to meet and chat with all of the local farmers. Mmmm...I think I need to go and eat some cheese right now. My new column of "A Passionate Foodie" can be found in the September 16 issue of the Stoneham Sun newspaper. This is a weekly column that concentrates on reviews of local restaurants though it also sometimes touches on other food and wine topics. The new column has been published today and will be available online soon. The new article is an overview of the Vermont wine industry, with some specific winery recommendations. Why not check out local wines from New England. As I mentioned previously, three stores in Melrose recently acquired wine/beer licenses. One of the stores, Sweet Thoughts, is already selling wine. The other two stores have yet to open but I eager await their debut. One of those forthcoming stores will be Beacon Hill Wine & Gourmet, which is owned by Gene and Rebecca Beraldi, the owners of Beacon Hill Wine and Spirits in Boston. Beacon Hill Wine and Gourmet will be situated at the corner of Main and Essex Streets. Rebecca generously provided me with some details of the new store, and it certainly sounds like it will be a wine and food lover's destination. Their wine inventory will be similar to what they carry in Boston, a diverse selection from Yellow Tail to boutique wines, and even fine and rare collectibles. The owners taste all of the wines in their stock, only choosing those which they find acceptable. Rebecca stated: "Fine wine doesn't have to be expensive - it just has to be good; and that's really the angle we take when we're looking to bring in less expensive to mid range products - as well as lesser known vineyards and varietals." Beside the wine, they will stock a full selection of beers too. As their cooler will be larger than the Boston store, they will be able to carry a larger, more diverse collection of beers. In addition, as the Melrose store will be larger, they will be able to carry a larger selection of cheese and gourmet foods. They will have artisan cheeses, cut to order, as well as retail packaged cheese, generally seeking to offer selections unavailable at local supermarkets. They will also stock: sausages/meats, dips, spreads, grill sauces, antipasti, oils/vinegars, nuts, candies and other specialty items. They will carry appetizers, a small selection of retail ready products, but after the holidays they will expand their selection to include items under their own brand. You will also find some wine glasses, linens and aprons and maybe eventually cookware and cooking accessories. After the first of the year, they will offer an in-store wine education series. They will also hold wine tastings at least once a week, if not more frequently. They will even offer delivery service. Rebecca stated that the most important part of their store will be "customer service and consumer experience." They want to build relationships with their customers, having them return again and again. The new store hopefully will open in about three weeks, barring any bureaucratic delays. So it could be open sometime in the beginning of October. Everything sounds very promising and I will definitely visit the new store soon after it opens and report back to my readers what I think. On October 5, expert winemaker Antonio Bravo will host an exclusive wine dinner at Legal Sea Foods in Park Square. Bravo, winemaker at Viñedos Emiliana—the organic project owned by the Guilisasti family of Concha y Toro—will join Chef Chris Cowen for a specially prepared four-course dinner with hand-picked wine selections from the Chilean vineyard. For reservations, please call (617) 530-9397. There is a general, and significant, difference between Europe and the U.S. when it comes to wine. For most Europeans, wine is integrally linked with food. They generally do not drink it on its own, but only when paired with something to eat. In the U.S. though, it is far more common to drink wine on its own. Wine is not seen as something that must be had with food. To each their own, but people in the U.S. may miss out on some excellent wines because they may not understand how European wines can taste so much better when paired with a meal. What might seem to be too acidic or too tannic might balance out when accompanied by food. This is simply a matter of better education, yet many wine stores in the U.S. are failing consumers in this regard. When these stores hold wine tastings, it is rare that they provide food with the wine, especially food beyond simple cheese and crackers (which seem more a palate cleanser). How often have you gone to a local wine tasting where they provided meat, such as beef or chicken, with your wine? I know that I rarely see such tastings. Without such food, a tasting cannot do complete justice to some wines which were specifically produced to be best when paired with food. So, consumers may turn away from certain wines they taste, only because they don't realize how well those wines would be if only they were accompanied by a delicious meal. Wine stores might actually sell more wines if they provided more food at their tastings. I have attended tastings that did provide food, and watched some of the other attendees embrace a wine they might normally not, only because the wine went so well with the provided food. So wine stores, why aren't you providing more food at your tastings? And to my readers, what are your experiences with food at local wine tastings? Napa Valley’s Truchard Vineyard will be the guest of honor for an unforgettable evening at BOKX 109 American Prime on Monday, September 17. BOKX 109 Executive Chef Evan Percoco has paired up with Truchard Vineyard to create a culinary fete. Guests will indulge in an exclusive five-course wine dinner, specially created for this evening only. Truchard Vineyards is a small, family-owned winery in the Carneros region of Napa Valley. Proprietors Tony and Jo Ann Truchard have managed a successful vineyard and grown exceptional grapes for over 30 years. Through their hard work and devotion to this unique property, they helped pioneer grape growing in the Carneros. In 1989, the Truchards established a winery and began producing wines using only their estate-grown fruit. I will be attending this dinner so hope to see you there. For reservations and more information call 617-969-5300. COST: $75.00, excluding tax and gratuity. Where do you get your ideas for new recipes/dishes? What is your process of creating a new recipe or dish? Do other members of your staff assist with creating ideas for new recipes/dishes? When creating dishes the first two things in my head are; what is the main ingredient going to be, and what is it I want to accomplish in the final dish? By doing these two simple steps I just built my building blocks for what is soon to come. It is very necessary to have focus when doing so. If not, I find myself experimenting with too many ingredients that don’t mix; so having structure and staying on track is key. Next I go to brainstorming and get to the basics; what do I know about this item and have I ever worked with it before? Now if I have, I start there and if I am unaware of the product I must go to the books and do as much research to find out what the best way to prepare it is, what the best flavors are, and how to get the textures to coincide with them. This is where it can get a little difficult, however crucial, to train myself to know my ingredients well so I can mix and match at will, and to know all that I can about the products I have at hand, because there is no point of putting in all the time and effort into creating a dish if you cannot properly cook your product to its fullest potential or have all of your elements come together as one when the final dish is finally plated. As chefs we need to always be thinking a few steps ahead and be aware of whether or not our actions make sense on the final dish. Does it have what I want, and does it show who I am when it is done? Now truthfully I am very blessed to be working with both Joanne Chang and Christopher Myers; mainly because since day one they have always had my back and have always been there for me to bounce questions and ideas off to them, in which they always guide me in the right direction both for my own knowledge and for the restaurant. Whenever an idea comes to mind I can run it by them, and they will let me know right off the bat what they like and what they don’t like; so, as explained before, they help build structure and focus for me to create new things. How do you test new recipes/dishes? Relate an unusual or interesting anecdote about the creation of one of your dishes. The next step for me is to get on the line and try out the recipes. After the first trial I’ll taste to see if what I really wanted to stand out is still the main feature, and that every other element in the dish complements each other, to make the final product work without being unbalanced. For example, we recently put together a wok-charred baby octopus dish with grilled corn, slathered in sriracha butter. As I thought about the baby octopus, I knew right away I wanted the dish to remain simple. I know octopus can take on heavy flavors well, so started with a quick blanch in a flavorful fish fumet, made a blistered corn sambal with roasted red bell peppers, and made my sriracha butter. I started by trying the octopus on the grill, but didn’t like that, so I went to the wok, which would guarantee far more heat than the grill. I then grilled the corn, on the cob, and mixed the grilled corn with the sambal sriracha butter. After that all gelled, it was time to work on the plating. Once I have found what I like I'll run it by Joanne and Christopher to see what their thoughts are, to check that they like the direction that I’m going in or if it even fits in what we are doing in the restaurant. Do you ever experience “writer’s block,” an inability to be creative, and if so, how do you deal with it? When creating new dishes there is always a point of difficulty in answering questions such as: did the dish came out the way I intended it to, will the price point fit into the menu we have, and, most importantly, is it who we are? I find it very easy to mix and match flavors and textures, but the trick with creativity is, does what you’re doing make sense, and are your clients going to understand? As said before I love simplicity, however, as chefs some of the simplest dishes are the hardest to make. If I just have 5 ingredients to work with, it may seem easy but experimenting to get all 5 ingredients cooked perfectly with the right technique, seasoning, and flavor all pulled together as one is sometimes difficult. Another issue you could run into is when you have everything going for you, and that one last aspect to finish the dish does not come to you. At this point it takes large amounts of time to go back to the books to research, re-plan, maybe take one thing out and add two completely new items, but still trying to keep it in the same direction as you started from can get frustrating. At these times there is nothing else to do other than trial and error. It is fun but can take time. When I am in a slump on paper, my favorite way to get out of the slump is to just cook and cook until I am back on track. After all, that’s really what it’s all about in the end; the creativity truly comes from the cooking. Da Vinci Ristorante’s Chef Shingara “Peppino” Singh has just created a very unique summer hybrid: Lobster Gelato. Available by special request only during the month of September, Chef Peppino has daringly combined two special summer treats—lobster and ice cream—to produce Lobster Gelato: fresh Maine lobster with milk, heavy cream, vanilla and sugar, sprinkled with a butterscotch-honey-mango sauce and delicately served in a chilled lobster tail. Chef Peppino has long experimented successfully with distinctive gelato flavors, including serving his signature Beef Carpaccio with celery sorbetti and shaved parmiggiano and his creamy gorgonzola gelato served on top of a poached pear. Other savory gelato flavors have included arugula and basil. This lobster gelato certainly sounds intriguing to me, as do Chef Peppino's other exotic gelato flavors. And if you want to try to make your own lobster gelato, here is Chef Peppino's recipe. Boil vanilla bean with cream and milk and strain after. Add everything and put in ice cream machine and grain. Cook the lobster body with butter than reduce and strain. Mix all ingredients and add one pinch of salt. Put the sauce on the plate. 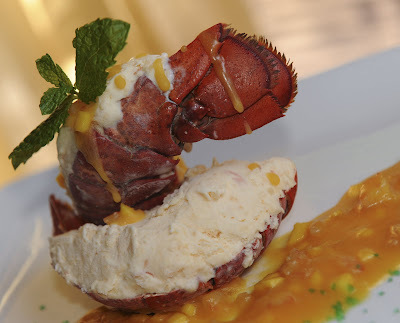 Scoop the ice cream inside of the lobster tail and garnish with the sauce and fresh mint. Stearns & Hill's Bistro: Shepherd's Pie!